I want to share with you our heart on the matter of the Church Repent Project. As abolitionists begin to focus their attention on exhorting the church, it is important that we clarify some things that could be easily misinterpreted. Our first message is that we come to you in a spirit of love and humility. We come to you as fellow brothers and sisters in Christ. Our message is one of exhortation, motivation, and inspiration about what all evidence proves to be an extremely urgent matter. While we come in a spirit of patience, we also want to be clear that we are calling brothers and sisters in Christ to act now. We also understand that each of us are sinners in need of God’s grace. And we call for a change in the Church not with an attitude of self-righteousness or of complete infallibility, but with an attitude of one brother awakening another to a stark reality that has been hidden, causing many Christians to miss it. Most of us have personal stories of truths to which we were once blind; thankfully God reached us through a fellow brother or sister who was willing to risk persecution and friendship because they loved us enough to share hard truth. Our attitude and mindset could be likened to that of a fellow teammate at the highest levels of competition. We are urging, encouraging and perhaps rebuking a fellow teammate in love to do what we know they capable of doing, and to raise their commitment and zeal to the level that God desires. We are on the same team and we are pushing you to go harder so we can defeat this foe of abortion together by God’s grace. Our heart on this matter is that we view the greatest evil in this fight not as the abortionist who dismembers children for pay. Nor is the greatest evil the abortion rights spin masters who deceive and lie about abortion, calling it good when it is in fact a great evil. Nor is the biggest foe in this fight the politicians who care more about the next election than they do the children who are being murdered at the rate of one every 30 seconds in America. We believe the greater evil is the apathy of God’s own children toward coming out against this mass child sacrifice. We believe that what grieves God’s heart more than the baby being murdered is that His own people are doing little or nothing to stop it. We believe this fight will be over when the people of God repent of their apathy toward abortion and come against this evil in a serious way. The church today is not unlike Saul’s army, which arrayed itself against the Philistine army yet did not engage. 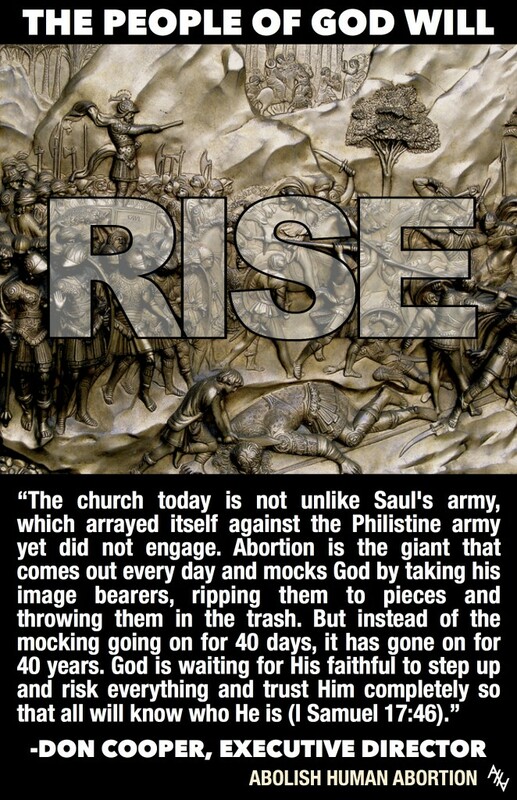 Abortion is the giant that comes out every day and mocks God by taking image bearers of God, ripping them to pieces and throwing them in the trash. But instead of the mocking going on for 40 days, it has gone on for 40 years. God is waiting for His faithful to step up and risk everything and trust Him completely so that all will know who He is (I Samuel 17:46). We believe that God’s people should come against abortion in a zealous and uncompromising way and that God will give His people the victory and put an end to this vile injustice. The Pro-Life movement has spent the last 40 years focusing its resources on calling the culture to stop killing its children. The Pro-Life movement continues to spend mass resources promoting legislation or political candidates that have produced little or no fruit. The Pro-Life movement continues to make big news highlighting what has been known for decades: that the abortion industry is out of control. But little or no energy has been spent calling Christians who have an obligation to love their neighbor as themselves to come against this evil. Most efforts of the Pro-Life movement are aimed at the sin of abortion itself rather than the sin of abortion apathy. Our heart and hope on this matter is that very soon the big news in the abortion issue would not be the extreme evils of an abortionist who kills children, but rather would be that God’s people have awakened to this true Holocaust and are coming against it like never before.